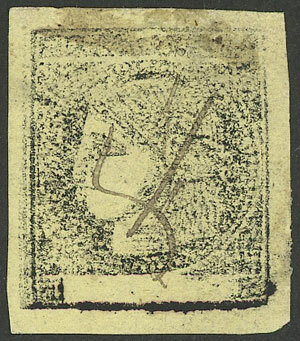 GJ.6b, yellow with COMPLETE DOUBLE IMPRESSION var., with pen cancel of Goya, rare! Lot 63 - Argentina general issues - Guillermo Jalil - Philatino Auction # 1916 ARGENTINA: "Budget" auction with many good lots at VERY LOW STARTS! Lot 47 - Argentina rivadavias - Guillermo Jalil - Philatino Auction # 1916 ARGENTINA: "Budget" auction with many good lots at VERY LOW STARTS!